Join swing vocalists Kevin Fitzsimmons and Kitty La Roar, plus the Pete Long Orchestra, for Sinatra, Sequins and Swing ‘The Capitol Years Live’ at The Apex on 7th April. Frank Sinatra’s Capitol years spanned from 1953 to1960, shortly after Frank’s Oscar winning performance in the classic movie ‘From Here to Eternity’. This era was a heyday of Hollywood screen sirens & Big Bands. Audiences at Sinatra, Sequins and Swing can hear talented vocals and musical arrangements of classic songs such as ‘World on a String’, ‘Come Fly With Me’, ‘Chicago’ and several duets by Kevin and Kitty that pay homage to that special musical era. Pete Long was long-time arranger for the Jools Holland orchestra and is currently the Musical Director of world famous Ronnie Scotts’ Jazz Orchestra. Pete’s 15-piece big band features many musicians from the RSJO and Vegas legend Buddy Greco described Pete’s Orchestra as “The best band I’ve ever worked with”. Big Band Jazz singer Kevin Fitzsimmons has an effortless Sinatra-esque vocal talent and an easy, natural on-stage charm. He is regularly called upon to record Sinatra-style voice-overs and jingles for TV and radio. Kevin says; ‘This show is a key event for any fan of 50′s Hollywood and Big Band Swing. And if you like the 60′s Rat Pack years – you’ll love this sensational ’Capitol Years’ production’. Described as the “voice of an angel with the presence and charisma of something far more devilish!” Kitty La Roar has a Marilyn Monroe look and a delicious sultry voice, which you can hear on songs such as Ella Fitzgerald’s ‘Too Darn Hot’ and Peggy Lee’s ‘Fever’. Sinatra, Sequins & Swing is at The Apex on Friday 7 April at 7.30pm. 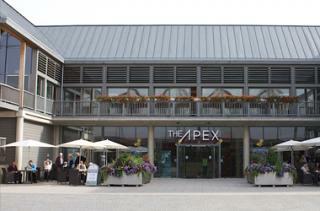 Tickets are £23, ring the box office on 01284 758000 or see the website - www.theapex.co.uk for details.